It’s not like these things just started happening. Andray Blatche missed that layup against the Bulls on December 22, said he was in one of the worst funks of his career, said it got his head messed up, and that mentally, he just wasn’t right. I hear him. I’ve played basketball before, plenty of times. Confidence is a huge part of the game. Maybe Andray needs a hug. Blatche has also earnestly admited that trade rumors bother him. ‘Blatche in a funk, trying to clear his mind,’ said a Wizards Insider headline on Tuesday morning. A funk indeed. 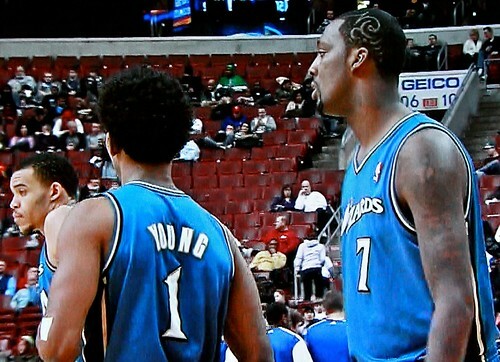 But really, and again, it’s not like these things just started happening with Blatche — been this way for years, it seems. Just now, at lesser levels of understanding. But hey, you do what you can do and try what you can try. 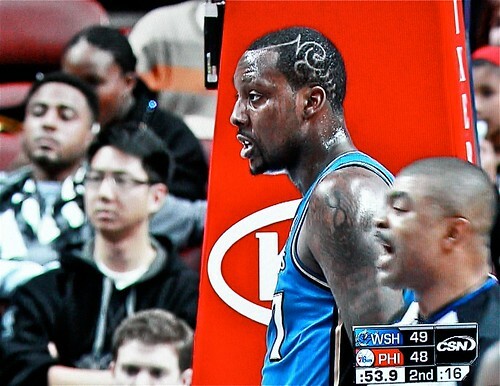 In an unrelated but could be related matter, Blatche got a new pattern cut into the side of his head. Blatche looked okay(ish) … sorta … against the Philadelphia 76ers on Wednesday night in a 109-79 loss, which made Washington 0-17 on the road for the season. Actually, he looked ‘okay’ early, then typical, then encouraging, then same ol’ same ol’, then, and finally, I don’t remember him. He had a basket at the 10:41 mark of the third and a hoop with 6:11 left in the fourth … and that was it for the second half. He finished the game with 17 points on 8-18 shooting, six rebounds, three assists, two steals, two turnovers and four fouls. He still did plenty of Andray Blatche things, but he played more composed … at times, on some level, at least in comparison to previous unfocused levels. But overall, not that good. I do imagine a scenario where Blatche is surrounded by veterans and where he is not the main option on a bad team. I do imagine him potentially being an awesome complimentary piece in such a scenario where he mostly checks himself and defers as necessary. Think about ‘Dray with the 2001 76ers NBA Finals team — they totally would have pushed the Lakers to six games instead of five (could be kidding, or not). Of course, this belief is contingent on Blatche coming off the bench. Now that he is a starter, it kind of ruins him in D.C. He’ll always see himself as starter material, even if the Wizards surround him, one day, with these so-called veterans. Because at some juncture, he’ll be the veteran (actually, right now he pretty much is). 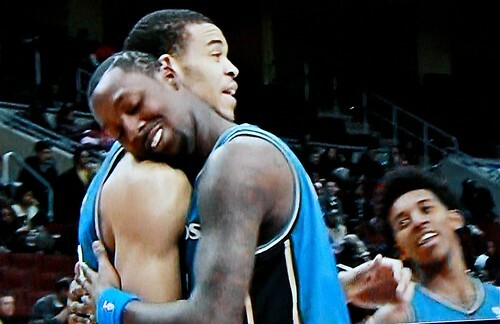 That and the fact that it simply doesn’t seem like Blatche and JaVale McGee pair well in the frontcourt. So in a sense, just like Gilbert Arenas, it might be best for both player and team to move on. Time for a song dedication.